Dr. Kalyana Sundram is currently the Chief Executive Officer, Malaysian Palm Oil Council (MPOC). Following his postgraduate studies from University of London, and research stints in USA, Australia, the Netherlands and at MPOB, he has clocked 36 years of services in the palm oil industry. This includes research into various aspects of oils and fats process technologies, nutrition and biomedical science and technical marketing. He is a fellow of the Malaysian Academy of Sciences and Fellow of the Nutrition Society. 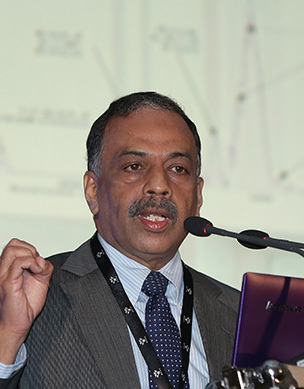 Dr. Sundram is primarily acknowledged for his work on palm oil and has served on WHO, FAO and IUNS expert consultations, published extensively and holds 21 patents. He has coordinated more than 170 research and promotion projects on palm oil including health, sustainability and wildlife conservation. Currently he heads MPOC with a focus on palm oil promotion and marketing, addressing the anti-palm oil campaigns and uses science based outputs to communicate the positives of palm oil. Following are the edited excerpts of the interview that was conducted during BR Research’s recent visit to Malaysia. BR Research: Pakistan’s market is quite important for palm oil producers. And with economic growth and rising consumption patterns, it is bound to pick up further. What is your strategy to expand your market share given that you are 25-30 percent of the market and the rest is Indonesia? Traditionally, Pakistan has been a very important market for Malaysian palm oil consortium. It is one of the top 5 markets for palm oil. Many years ago, Malaysia was a major producer and exporter of palm oil; we depended heavily on the market in Pakistan. We did a lot of work in developing the market in Pakistan, teaching the industry how to maximise the use of palm oil. For many years, we were the market leaders, but unfortunately, after the Pakistan-Indonesia FTA, the level playing field was no longer present. The price advantage to Indonesian palm oil was very obvious, and gradually we declined in our share of palm oil to Pakistan. Our crude palm oil exports are taxed. This also impacted our market. Hence, our market share has decreased significantly, and the challenge for us is how to increase our lost market share in Pakistan. To be honest, this is going to be a challenging task because Pakistan is a price sensitive market. However, on the other hand, we are learning that there are segments of market in Pakistan that value quality and assurances from the Malaysian producers, and we see some kickback coming to the Malaysian producers and exports. We are also seeing a development of packed-products. The market for packed products is increasing in Pakistan, which I think offers a potential for growth for Malaysian palm oil. We need to work on this with our distributors in Pakistan. This is one of our agendas for 2018. Coming to consumption, the consumption patterns in Pakistan are pretty varied. You have the affluent segment that is sometimes blamed for over consuming oil and fats. It is typical of what you see in the rest of the subcontinent; let it be Pakistan, India, Bangladesh and all the way to Sri Lanka. The poorer segment of the population on the other hand, is under consuming fats and oil. Ideally, fat consumption should be at least 25 to 30 percent of your daily energy requirement. If you factor that along with Pakistan’s population, there is significant room for growth for all oils and fats in the country. And as the economy develops and per capita income increases, one of the first things that the population spends on is food, especially oils and fats. If that happens, you will see a significant growth in total oil consumption in the Pakistani market. BRR: Do you think there are any government policies that discriminate against Malaysian palm oil? KS: No, there are no trade barriers. It’s just that the competition has affected Malaysian palm oil. Price-wise, we are a little bit disadvantaged because our production cost can be slightly higher. Secondly, there is a requirement for crude palm oil to flow into Pakistan so that the refineries there can refine the product. It becomes a challenge for Pakistan to depend completely on Malaysian palm oil because of the 7-7.5 percent duty we have on our crude palm oil exports; furthermore, the FTA between Indonesia and Pakistan has facilitated Indonesian exports into Pakistan’s market. BRR: If rising per capita income can offer a significant room for growth to Malaysian palm oil, does it mean that the Malaysian palm oil is superior in quality to Indonesian palm oil? KS: No. The quality characteristics of traded palm oil, whether Malaysian or Indonesian, are often identical. But what we have is the tradition of supplying quality products to not only Pakistan, but all over the world. People who know Malaysian suppliers are generally comfortable with them; Malaysian suppliers are preferred. Price is not the criteria; it’s the relationship and trust we have built over the years. BRR: Most of the palm oil coming into Pakistan is refined. If we go back to crude palm oil, do you think Malaysia could get a bigger share of that? KS: No. Our supply of crude palm oil out of Malaysia will be limited. We have our own refining capacity in this country. And our priority is also to provide refining to our production. We need to add value into our own production. So the amount of crude palm oil that will be sent out of Malaysia will be limited. BRR: How much do you expect your market share to increase in the next five years? KS: If we can progressively increase the market share from the existing 25-30 percent to 40 percent in about two years’ time, it will be a great achievement for us. But it’s an uphill ladder to climb. BRR: What have you been doing about the health issues related to palm oil? Recently, there are campaigns in Pakistan as well like that by Punjab Food Authority against Vanaspati ghee. KS: Historically, there have always been accusations on palm oil for health and nutrition. It all started in the 1980s with anti-palm oil campaigns. How did we respond at that time? We did not have evidence. So we responded by commissioning health and nutrition studies and clinical trials all over the world including Pakistan. We did a lot of work at that time with Agha Khan Medical Centre, Karachi and the Armed Forces Institute in Rawalpindi. They were directed to undertake research. Nearly 170 studies later, we established the fact that no harm comes to the populations with the continuous consumption of palm oil. At no point did we claim of any palm oil’s miraculous characteristics. In Malaysia, around 80 percent of the fat consumption is provided by palm oil. Hence, this country is a living proof that palm oil is not hazardous. Yes, over consumption of anything is harmful. The problem that we see in Pakistan is related to Vanaspati. Vanaspati is partially hydrogenated. Since the 1990s, there has been growing evidence that if you consume partially hydrogenated fats containing trans fatty acids, you increase the risks of heart diseases. Many countries around the world including the US, are now legislating to remove the trans fatty acids from their supply chains. We fully endorse the removal of trans fatty acids and partially hydrogenated oils. We have been telling Pakistan that if you want to reformulate Vanaspati, we can offer formulations that can be made with palm oil that are zero in trans fatty acids, and yet you will get the characteristics and the texture of Vanaspati. Punjab Food Authority is campaigning for a total liquid oil diet in Pakistan. But you have to be very realistic here. There are two parts of the population around the world: One that consumes liquid oils, and the other that consumes solid fats like Vanaspati, ghee, butter etc. It is the culinary habit of the population. You need to bring in functionality. What you can do is a combination of liquid oils and solid fats. We are doing this in Malaysia, and this is happening in the rest of the world. If you want to ban solid fats, you have to completely change the eating habits of the population of Pakistan. Are you prepared to do that? We are planning to sit down with the Punjab authorities in January, give them all the evidence and ask them to be reasonable and rationale based on scientific evidence. I would like to go one step further, and tell them that we are prepared to engage in a research undertaken in Pakistan for the said issue. The global evidence is changing. From the perception that saturated fats are bad for you, today the health pundits are screaming that they do not see evidence associated with saturated fat consumption or solid fat consumption with risk of certain diseases. The food authorities have to weigh in all the unbiased data and figure out what’s manageable. BRR: Assuming that we do remove all Vanaspati from Pakistan, what would we be importing? KS: You would probably be importing genetically modified soya bean oil. It could also be genetically modified sun flower oil, or rapeseed oil. The cost of these imports to the country will also be significantly higher, because palm oil trades at a discount to soya bean, sunflower, rapeseed oils. BRR: How is the oil and fats industry doing around the world? KS: In the western hemisphere, the growth of oils and fats has saturated as their fat consumptions averages around 35-40 percent. However, in Asia, Africa and the Indian subcontinent, the total fat consumption is even below the minimum FAO recommendation, which is 20 energy percent. It is this part of the world where growth will happen. BRR: With rising per capital income, do you see Pakistan start consuming palm oil in other areas? Do you have any advantage over Indonesia in non-food palm oil use? KS: I think the use in oleo chemicals like soaps, shampoos, cosmetics, detergents, etc. will increase as income per capita increases. It’s an untapped market, and offers opportunities when diversifying. Today in Malaysia, 75 percent production of palm oil is for food, while 25 percent goes to non-food segments. Oleo chemical industry is centred in Malaysia. We have that advantage. Twenty years ago, this was centred in the US. Indonesia is catching up, but we are the market leaders in oleo chemical industry because of the technology, innovation and experience. Let me just add here that palm will remain a major food commodity. There is no running away from that. Other applications will increase, but I think the ratio will fall back to about 75 to 25 percent maximum. BRR: Pakistan faces the challenges of malnutrition – stunting and wasting especially in children and youngsters. Do you think that the consumption of these fats could somehow resolve this issue partially? KS: Definitely, from a nutrition perspective. Many years ago, people used to talk about protein- energy malnutrition. Energy malnutrition is still prevalent in many segments of the population. In almost all developing countries including Pakistan, there is a problem of vitamin A deficiency. Children go blind if they remain untreated. We developed a palm-based product called red-palm oil, and we did intervention studies in Pakistan as well. You only need one table spoon of red-palm oil daily to overcome vitamin A deficiency. Vitamin A eradication programs are run by agencies including the UN; and the pharmaceutical companies have a very big footprint in the drives. Unfortunately, we have been kicked out. I would like to say to the Pakistani authorities that if you can have red-palm oil as a part of the solution for addressing malnourishment, we will be willing to participate.